Our most popular Pub Table is combined with three (3) retro grooved chrome barstools (Model 215-782) in a classic pub package. The 30″ Round Pub Table has 2¼” real metal banding, premium bar height chrome column and base. Available in your choice of standard and premium boomerang or cracked ice laminates. The barstools are available in your choice of standard or designer vinyls with an optional #404 footring. 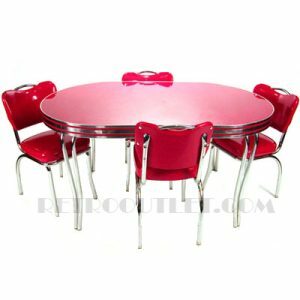 Please allow 5-6 weeks for production on all diner furniture manufactured per your specifications.